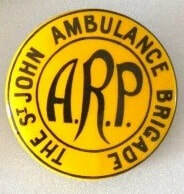 St. John Ambulance Brigade ARP lapel badge. 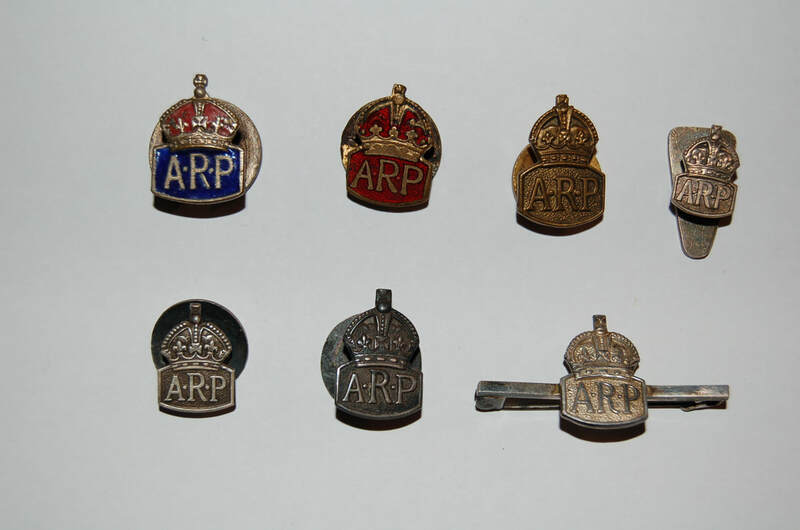 A vast number of lapel badges were manufactured before and during the war featuring the ARP and CD letters. The most common is the silver ARP lapel badge. A number of organisations also approved badges that could be worn on civilian clothes - Red Cross and St. John Ambulance for example. Wearing the badges showed the wearer was a member of the civil defence services and playing an active part in the war effort. 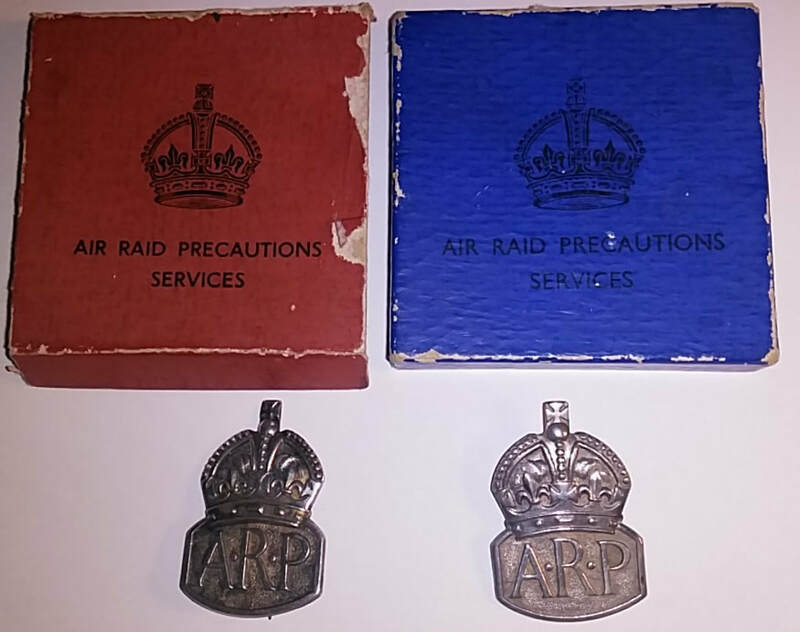 For anti-gas and air raid precautions instructors' badges see this page. After successfully passing ARP training, new wardens were presented with a silver ARP lapel badge. Brooch fitting in a red box for ladies and half moon lapel badges in a blue box for men. The boxes had "AIR RAID PRECAUTIONS SERVICES" written on them with a King's crown motif. Dates on silver hallmarked badges: 1936 (A), 1937 (B), 1938 (C) & 1939 (D) (some sources claim there is a 1940 E-dated silver badge but no photographic evidence has yet come to light). Base metal versions were also produced by a number of manufacturers (e.g. Marples & Beasley and JR Gaunt) for wardens trained during the early years of the war. The issuing of metal ARP badges stopped in 1943. Silver ARP lapel buttons - red box and pin fitting for ladies, blue box and buttonhole fitting for men. Numerous variations of ARP lapel badge exist and are avidly collected. Most companies had badges manufactured and given to their workforce. Several style of CD badge existed during the war. From the simple CD letters to badges featuring the Civil Defence rainbow emblem. 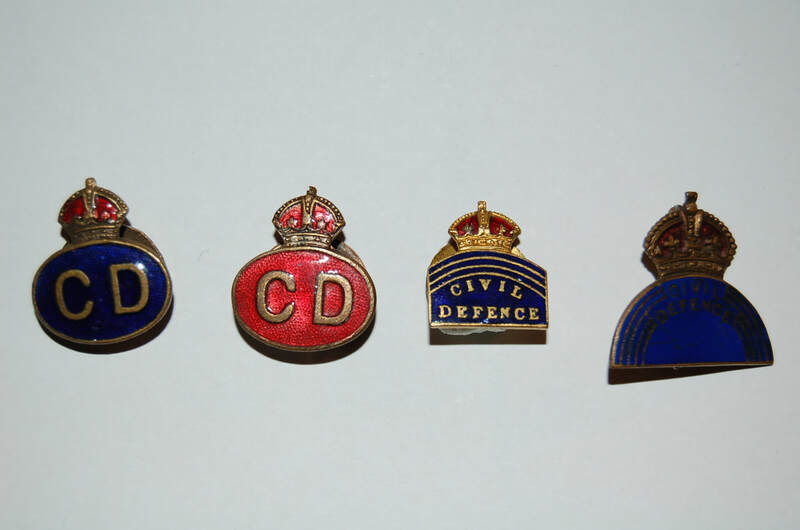 WW2 Civil Defence lapel badges.